On May 21, 2000, Fedor Emelianenko competed in his first MMA bout, defeating Martin Lazarov by first-round submission at Rings Russia: Russia vs. Bulgaria. No one knew what to expect from the stoic looking individual from Stary Oskol, Russia coming out of that bout. But what the world ended up getting is arguably the greatest heavyweight in the history of mixed martial arts. After losing by controversial doctor’s stoppage against Tsuyoshi Kohsaka in December 2000, Emelianenko (38-5, one no contest) went on a nine-year unbeaten streak where he accumulated a record of 27-0-1 from April 2001 until June 2010. During the run, Emelianenko defeated four former UFC champions, one Pride champion, one former and two future K-1 champions and two Olympic medalists with 21 of those wins coming via stoppage. Emelianenko also won the Pride heavyweight championship and held onto it from March 2003 until the company folded in 2007. This unbelievable streak came to end when former UFC heavyweight Fabricio Werdum submitted Emelianenko in the first round. It’s been a bit of struggle for Emelianenko since then, going 7-3. “The Last Emperor” gets another shot at gold on Saturday in the main event at Bellator 214 when he faces off with light heavyweight titleholder Ryan Bader in the finals of the heavyweight grand prix with the winner emerging as the champion. For Bader, his career will continue on after Bellator 214. For Emelianenko, this is very likely his last stand. Although he never competed in the UFC, it’s hard to take anything away from Emelianenko’s stellar career, which saw him dominate the best heavyweights of his era. There will always be questions regarding what would have happened if Fedor competed in the UFC. Once Pride folded, the UFC had the cream of the crop in the heavyweight division. Who wouldn’t have wanted to see Emelianenko taking on the likes of Brock Lesnar, Randy Couture and Cain Velasquez? Unfortunately, the two sides could never come to an agreement, which left the legacy of Fedor with a massive question mark. We have heard the stories about meetings on a secluded island, record-breaking contract offers, Emelianenko not liking how UFC president Dana White treated his fighters and not wanting to co-promote with his M-1 Global promotion. The truth likely lays somewhere in the middle on what really happened. Emelianenko has struggled since he turned down the overtures from White. Some of that has to do with Fedor facing stiff competition with Fabricio Werdum, Antonio “Bigfoot” Silva and Dan Henderson handing The Last Emperor losses. Another factor was Father Time, who had its way with Fedor along with the wear and tear he accumulated in wars against the likes of Mirko Crop and Antônio Rodrigo Nogueira (three times) during his time in Pride. Emelinenko is 42-years-old and isn’t getting any getting younger. All of the setbacks haven’t prevented Emelianenko from becoming a mega-star in the United States. He still receives a hero’s welcome whenever his image is shown at an event he’s attending or when he makes the walk to the cage before a fight. And it will be no different when he takes on Bader at The Forum in Inglewood, Calif.
Bader (26-5) is a heavy favorite heading into the fight and rightfully so. He’s 10-1 in his past 11 fights and made it look easy in the process. A win makes “Darth” the first fighter in Bellator history to hold two belts simultaneously. 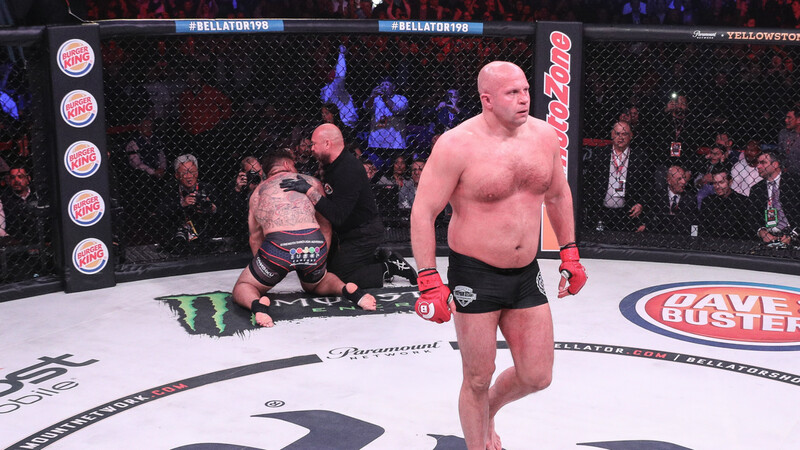 Bellator 214 should signal the end of one of the most storied careers in mixed martial arts. Emelianenko can go out like John Elway and Peyton Manning in winning a championship in one of his final performances. However, a loss would also signify there’s nothing left to do. He has accomplished all that he could in his career while earning enough money to last him for a couple of lifetimes. Win, lose or draw when Emelianenko is sitting in his locker room and getting dressed after Bellator 214, he should grab his white cowboy hat, walk out of the arena, get on the white horse and ride off into the sunset without looking back. He truly has nothing left to prove.